Corrèze, located in the centre of France, will seduce you with its bucolic landscapes and its soothing calm. It is quite naturally that the horse has found its place in this green country. The region is full of unique and preserved natural sites. 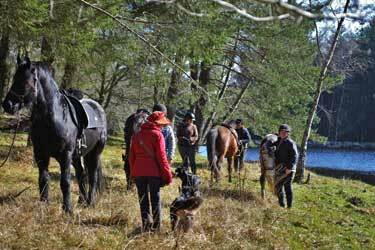 On horseback from lakes to waterfalls, peat bogs to forests, a thousand paths travel landscapes that are often thousands of years old... an ideal setting for a beautiful horseback ride in the heart of nature. Arriving in Corrèze to the guest room, squeezed in a little hamlet. Laurent welcomes you to his home, in a typical barn completely renovated into a guest room. You will be able to access the park, the swimming pool and the surrounding forests. After breakfast, departure for the stables where you will discover your travelling companions. Contact with the horses in the riding arena and departure for the first ride. No major difficulties for this first ride. 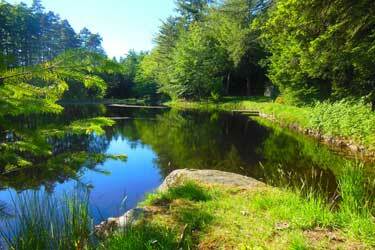 You have a glimpse of the Corrèze landscapes, forests, 3-level ponds, Limousin cows... Arrival at the pond of Ruisseau de Lamat. You will have the possibility to swim (alone or with the horses... depending on their mood). Picnic at the pond. In the afternoon, departure from the pond of Lamat in the direction of Laborde. On the way we will cross a typical and rural village of Corrèze, the Liac. Then we enter the heart of the correzian forests with the first gallops on the tracks and forest roads that surround the ponds. At the bend of a path it is not uncommon to see deer or roe deer. Dinner and night in the guest room. A little more sporting day today. 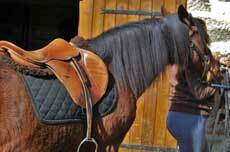 With large forest tracks suitable for galloping. After breakfast, departure for the Theil de Saint Pardoux; ride around the pond of the Theil and its Castle. Picnic on site. 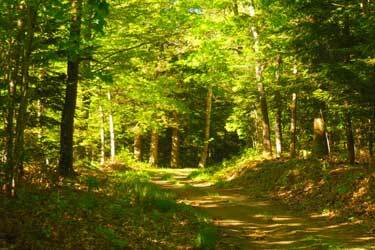 In the afternoon, departure from Le Theil towards Les Caraboussets and the large forest trails. Gallops and ponds are waiting for you until you reach the place called Coudert where we leave the horses for the night. 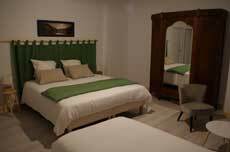 Transfer, dinner and overnight stay in the guest room. Breakfast, then departures of riders. 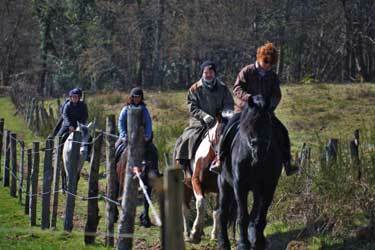 After breakfast departure for the stables where you will discover your travelling companions. Contact with the horses in the riding arena and departure for the first ride. No major difficulties for this first ride. You have a glimpse of the Corrèze landscapes, forests, 3-level ponds, Limousin cows... Arrival at the pond of Ruisseau de Lamat. You will have the possibility to swim (alone or with the horses... depending on their mood). Picnic at the pond. In the afternoon, departure from the pond of Lamat in the direction of Laborde. On the way we will cross a typical and rural village of Corrèze, the Liac. Then we enter the heart of the correzian forests with the first gallops on the tracks and forest roads that surround the ponds. At the bend of a path it is not uncommon to see deer or roe deer. Dinner and night in the guest room. After breakfast, transfer to Le Coudert. You will leave in the direction of the town of Marcillac la Croisille. We arrive at Lake Valletta, which covers an area of more than 230 hectares and offers unspoilt and wild landscapes. Picnic around the lake. 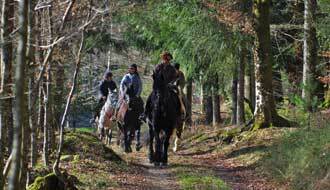 Riding around it in the heart of the Corrèze forests, a moment of real well-being. Back to Le Coudert to take care of the horses. Transfer and dinner at the guest room. Probably the most beautiful day of riding! After breakfast, transfer to Le Coudert. We leave in the direction of Clergoux and enter the Domaine de Sédière. We discover 130 hectares of forest, white water and ponds in the middle of which stands the Château De Sédière, built in the 15th century. Picnic in the domain. In the afternoon, riding in the domain. Then departure to the small hamlet of Pouymas where we say goodbye to the horses after taking care of them one last time. Transfer and dinner at the guest room. Important: The above itinerary is provided on an indicative basis and our guide reserves the right to modify the itinerary depending on the condition of paths and the seasons. + "à la carte" departures from April to October on demand, please consult us. - Transfers from and to the Tulle train station or Brive airport (20€ per person for the round trip) to pay on site. 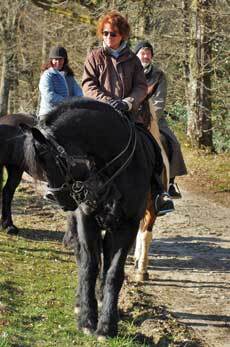 Our riding tours are for riders feeling comfortable at the three gaits, you will ride an average of 4 to 5 hours a day. If you privatize a departure (4 riders), we can offer departures for beginner riders. 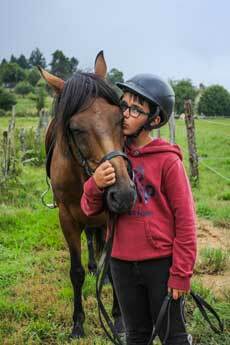 Minors accompanied by their parents are accepted from 12 years old, if they have a sufficient equestrian level. To discover the Corrèze, you will be accompanied by Florence a professional and passionate guide, who will be able to transmit to you her love for the region. A vehicle bring picnics for lunch. The building, an old barn built in 1912 and completely reorganized in 1984, is a typical stone building in the region, covered with slate from Travassac. The covered swimming pool will cool you down on hot summer days. Lunch is in the form of a picnic (no sandwiches), it is brought by the logistics vehicle and eaten in the middle of nature. In the evening, a full dinner based on local products will be served in the guest room. Languages spoken by the guide: English / French / Spanish speaking guide. A transfert is possible from Tulle train station (about 30 minutes drive) or from Brive train station/airport (about 1 hour drive), (20€ per person for the round trip) to pay on site. On the first day, please plan to arrive around 3pm to the guest room. On the last day, departures are possible from 9am from the guest room. 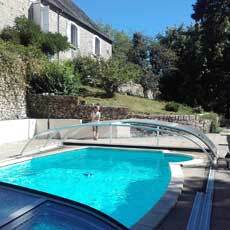 It is a star-shaped hike around a beautiful accommodation typical of the Corrèze where you will be able to enjoy its swimming pool in summer. A hike in the heart of the green country, a real breath of fresh air. History, natural landscapes, ad local gastronomy. At the heart of preserved natural sites.